In wide stances, make sure that your knee remains abat e what is called the substantial ' foot - the one canying the weight - and is not turned or twisted inwards (see left). Rather, always try to keep your thigh, knee, shin and foot in line (see right); weakness of the energies that flow along the inside of the leg can be responsible for any difficulty in achieving this /xisition. into be aware of this and correct it by spiralling the knee back over the foot. Narrow stances should not he too narrow, as shown far left. As a rule, the front foot should always be roughly in a line with the edge of the back heel, and not too close to it in terms of length either (see left). Try to be generous with this type of stance, and make sure that the thigh, knee, shin and foot are all aligned, so that your foot does not protrude out to the side in a twisted fashion. Try not to introduce any ttttnecessaty tension by raising the heels or toes too much. Once you are familiar with the basic stances and principles, you are ready to begin learning the form itself. All the movements are clearly illustrated with photographs showing both the yin phase (the 'yielding' aspect which accompanies the in-breath) and the yang phase (the 'thrust' of the movement which accompanies the out-breath). If you pay close attention to the positions shown and read the instructions carefully, you will find it easy to follow the movements yourself. Remember - be patient. Learn each section thoroughly before going on to the next, and think in terms of months rather than weeks for learning the form all the way through. Although the entire sequence should take around eight minutes to perform, it can be done more slowly if you wish. Beginners tend to be a little faster than the more advanced students, although Master Cheng himself used to do it in five minutes or less! The main thing is to feel relaxed with what you are doing, and bear in mind that extreme slowness can introduce more tension than it removes. Find your own pace, and let this take you wherever you need to go. On the foot diagrams, the foot bearing the higher percentage of weight is labelled. The shaded area indicates the part of the foot in contact with the ground. Against these diagrams you will find the cardinal directions of north, south, east and west (except for the stances involved in moving from one direction to another). These are traditionally used by tai chi teachers to help students find the correct orientation; here, they are given as a guide only, to help with the learning process. In practice, this is preferable to continually referring to left and right, which can become confusing. You do not literally have to face these directions. When dotted lines are shown, these indicate a change of position - that a step has taken place: the dots show (he location of the previous stance. The hands are only illustrated when they are within your field of vision; there are, therefore, occasions when only one hand is illustrated, or when neither hand is shown. These illustrations help to ensure that not only are you looking in the right direction, but also that your hands are as they should be, since the hand positions may not always be easy to see in the photograph. Each movement is accompanied by instructions for breathing: do not force yourself to follow ihese if you feel at all uncomfortable. Begin by finding your own rhythm of inhalation and exhalation; you will gradually begin to tune in to the breathing patterns given. Remember that in tai chi the learning process should always be one of discovery and fun. Relax and enjoy it! 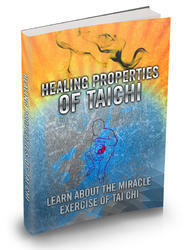 A Deeper Level Tai chi has a strong mental and even spiritual aspect. 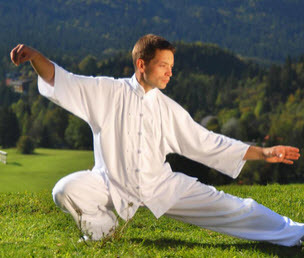 It is not essential for you to explore these areas in order to obtain the wonderful benefits that tai chi can bring in terms of physical health and relaxation, but they will help you find satisfaction and enjoyment in what you are doing. 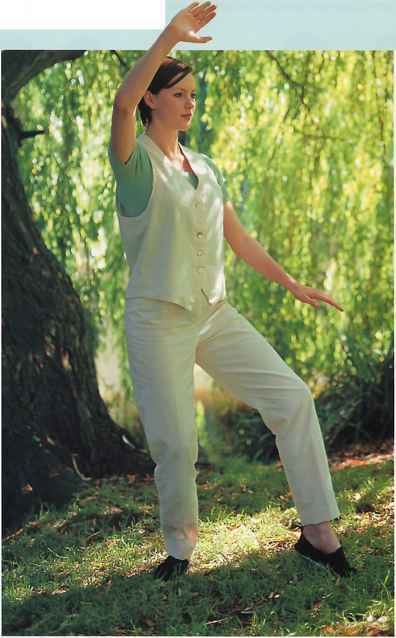 Ii all comes down to understanding the original concept of the universal Tai Chi', the supreme ultimate energy often depicted as a circle divided by a graceful curve (the Tai Chi Tu - the yin-yang symbol: see page 128), suggesting movement and change. 'Change' is the key word. The light half of the circle is yang, the dark half yin; these two forces, the positive and negative forces of nature, balance and complement each other perfectly in a state of continual harmony. Each one nourishes and supports the other in a perpetual rhythm of change. Translated into physical movement, this gives us the tai chi form, which alternates constantly between negative and positive forces, accompanied by the in-breath (yin) and the out-breath (yang), so that the changes take place at a very deep level. These ideas are explored more fully in Part Two. For now, be aware that your tai chi is a reflection and celebration of nature, of great universal forces and rhythms with which we can work in harmony to benefit ourselves, not only physically but mentally and emotionally as well.